Wet N Wild is probably one of the most recognized budget friendly cosmetics companies around and I have been a fan of their products for as long as I can remember. So I was really excited when I was given the opportunity to review some of their nail polishes for my blog! Today I have four of their "Wild Shine" polishes to show you! Two of them are (amazing) colors, and two of them are toppers (that could be worn on their own too, but really shine in all their glory when layered over colors). 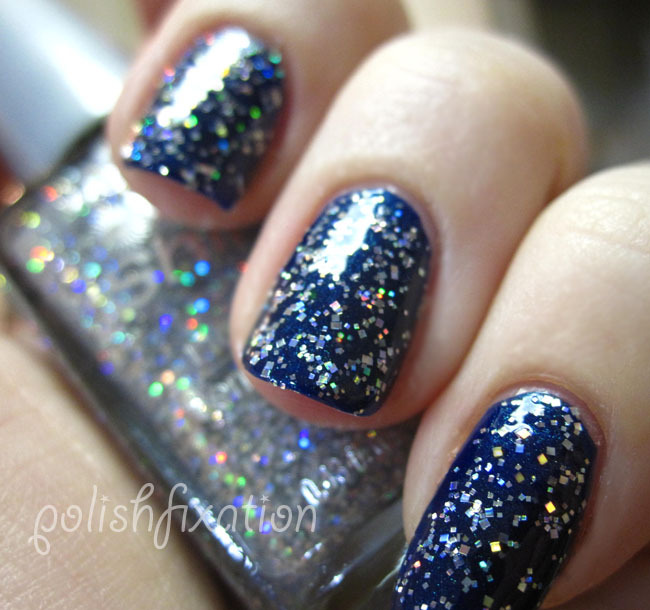 Blue Moon is a gorgeous deep blue frost that is incredibly shiny (as are all the Wild Shine line of polishes!). I really liked this shade in the bottle but LOVED it when I got it onto my nails. It was a smooth and clean application of just two coats for the opacity shown in the picture. Eggplant Frost is a really unique shade of frosty purple! I don't have another purple in my very large collection that looks anything like this. The shine on these polishes is seriously intense! It was really hard to capture the true color of this polish, as purples tend to be stubborn, but I think the image is pretty close to how it looked on my nails. This one also had a great, easy application of two coats. 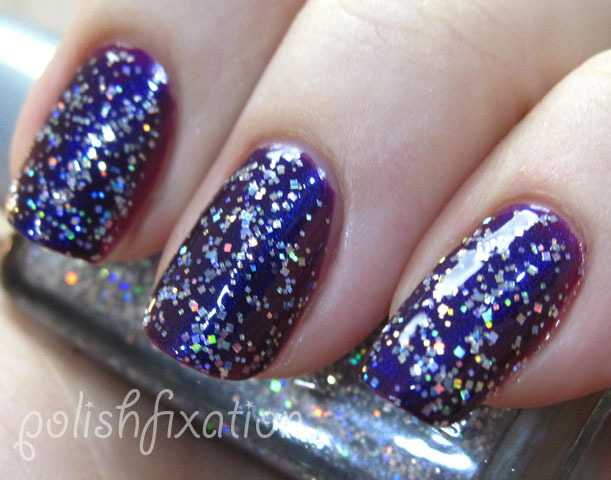 Hallucinate is a really fun and sparkly topper polish. I didn't try wearing this polish on its own as I don't think it really would have photographed well. I topped it onto two previous colors and think it looks really pretty! It's a small to medium sized iridescent glitter in a completely clear base. I think this would be great to layer on almost any color, on lighter colors the effect would be more subtle and on darker colors such as these that I have swatched it on, you get a more dramatic "starfield" like effect. Love it! Kaleidescope is another fun glitter top coat. This one is a mix of smaller and larger square shaped holographic glitter in a clear base. I love the shape of the glitter in this one, and the coverage is excellent and very easy to work with, which a lot of other glitters of this type are not (some are too goopy or sparse). Another winner for me! Final verdict on Wet N Wild Wild Shine polishes: I love them! After receiving these I have already gone out and gotten several more colors from this line! They have a huge range of colors and are super affordable and can be found from as low as $0.69 to $0.99!! Most drugstores and supermarkets with beauty products carry the Wet N Wild polish lines. Also find and "like" them on facebook! : Wet N Wild Beauty on Facebook! What do you think of these (and other) Wet N Wild polishes and cosmetics? Very very pretty polishes! I got some Wet n Wild polishes today as well. I just picked up Hallucinate yesterday. So happy I did it's beautiful! I love these polishes: I own 22 of them! Wow wow wow LOVE the glitter!